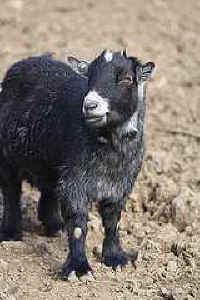 Harold, the little black pygmy goat with the shortest legs and the deepest voice, was euthanized last week. Harold was special. He won the hearts of staff and visitors, first with his small stocky stature then with is big personality. He was buried near the rolling hills and rock piles he was to climb in Grass Valley, and his presence is missed on the steep hills in Vacaville. Harold arrived at Animal Place five years ago. He was found tied to a fence at a slaughterhouse, sick, anemic, riddled with parasites, and practically blind. He was treated with antibiotics for his infections, dewormer for his parasites and anemia, and a slew of eye ointments to help his painful eyes recover. The vets questioned whether the corneal ulcers would rob him of his vision forever. Slowly, with gentle care he had most likely never known, received from people he couldn’t see, he started to improve. His anemia cleared, he could see, and he learned some people could be trusted. He never really came around to being the most social of goats, except when he wasn’t feeling well. Harold sought attention when his teeth were causing him pain. He sought attention when he could feel the restriction of the mass growing in his lungs. Maybe he remembered the first time he was nursed back to health. When he started being social with people a month ago, we encouraged the interactions, picking leaves from the tree he could never reach. We soon noticed he had difficulty breathing. He was examined at UC Davis’s veterinary hospital and found to have a mass or abscess stealing a third of his lung space. When they recommended restricted movement and isolation, we had a tough choice to make. We knew his time was coming to an end and couldn’t bear the thought of keeping him from his friends. 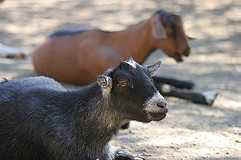 In the end, we let Harold decide – did he want to spend his remaining days grazing alongside his goat friends? He stayed out with the herd. We gauged his quality of life as best we could. Harold told us when it was time. 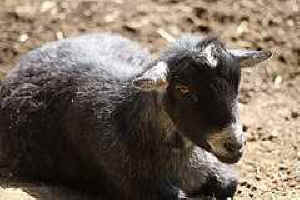 His breathing worsened and he stopped going to graze with the goats. We scheduled a vet to come and euthanize him at the sanctuary, the only place he knew as home. When I scooped him up to take him to the stall for his last few minutes, his loss of weight and will to fight were shockingly apparent. The entire staff was there as the drugs were administered, and his labored breathing slowed, then stopped. Deciding when to euthanize is definitely the hardest part of my job. We decide as a group, considering the observations and emotions of each staff member. Sometimes we arrive at the decision to euthanize at different points in disease progression. Regardless of our personal timing, it seems the animals always tell us when they are ready. It could be as dramatic as Val the pig showing us her legs no longer have the strength to lift her heavy body or as subtle as Nancy the goat gradually slowing down then losing the spark from her eyes. Of course its never easy, but having a consensus, especially with the animals, makes us feel more assured of our decision. Providing these animals with a great life includes helping them pass as painlessly as we can, as hard as that can be. I play the images of Harold scampering down the steep hills with his short gait, of him saying hello to the dentistry vet by planting his front hooves mid-thigh, of all the things that made Harold so uniquely Harold and they remind me we gave him the best life possible.